This toy was an instant favorite from the moment its first loud Bang! and flash of orange flame launched the little black film can up to bounce off our 26 foot ceiling. 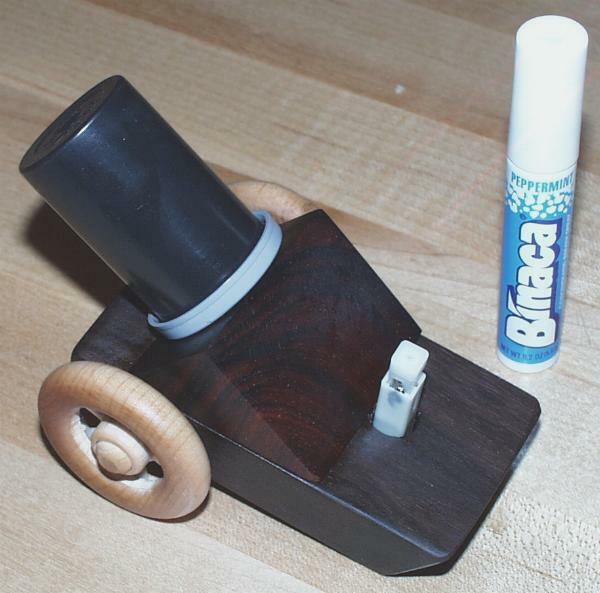 It has several names: the Piezo-Popper, the Binaca Bomb, the Photo-Flash -- you will probably come up with more. The toy is very easy to make, going together in about 15 minutes, at a cost of two or three dollars if all the parts are purchased new, or free if you don't throw away certain common household items. The fuel for the cannon can be found around the house. We have run ours on perfume, hair spray, and (our favorite) Wintergreen Binaca mouth freshener. The cannon is very simple. A pair of wires are pushed through a slit made in the top of a plastic 35 millimeter film can. The other end of the wires are soldered to the igniter element from an electronic cigarette or fireplace lighter. I chose to mount these elements on a block of wood, but this is optional if you're in a hurry. 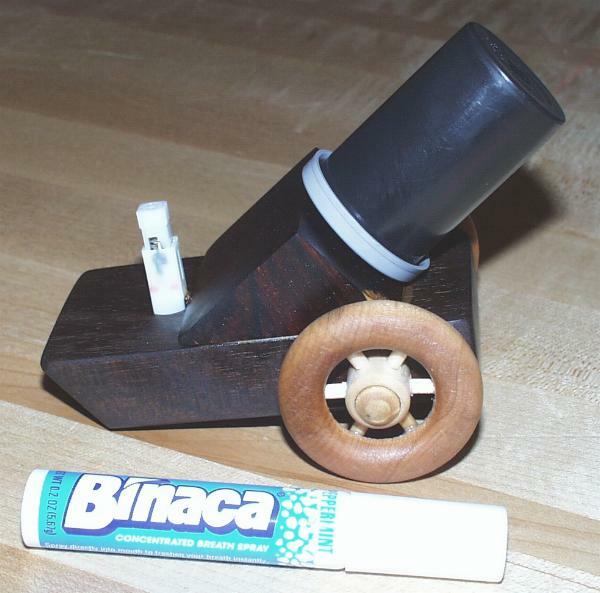 To fire the cannon, you spray the fuel (one squirt of perfume or Binaca, or a very short squirt of hair spray) into the plastic film can, push the can down on the lid, and press the igniter. With a loud Bang! and a flash of orange flame, the little can goes sailing into the air. With some practice in getting just the right amount of fuel in the can, it will go as high as 30 feet straight up. If too much or too little fuel is used, it will either not ignite at all, or it will not go very high. The finished cannon is shown above, next to the first fuel we tried, a bottle of perfume purloined from an unsuspecting donor. Here it is with the can removed from its launch pad. You can see the two wires coming through the slit in the lid. The block of wood has three holes drilled in it. Two go all the way through, so the wire can be threaded through them. The other hole does not go all the way through, and it used to hold the igniter. Here is the bottom view, showing the wire threaded through the holes. You can also see the stick-on rubber feet that keep the wire from making the block wobble. You can get these feet at Radio Shack, or at a cabinetry supply shop or hardware store. Here is a closeup of the spark gap formed by the stripped ends of the two wires. There is nothing critical about this arrangement -- as long as the wire ends are bare and close enough, a spark can jump across the gap when the igniter is pushed. Here is a closeup of the igniter, showing the wires soldered to its contacts. There are many types of igniters in the different brands of electronic lighters. 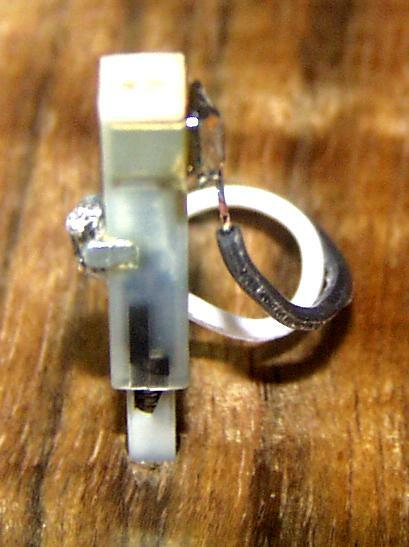 Above is the igniter from a small Scripto Electronic lighter. It is smaller, and not as sturdy as the ones from the fireplace lighters, but the small lighters are usually less expensive. 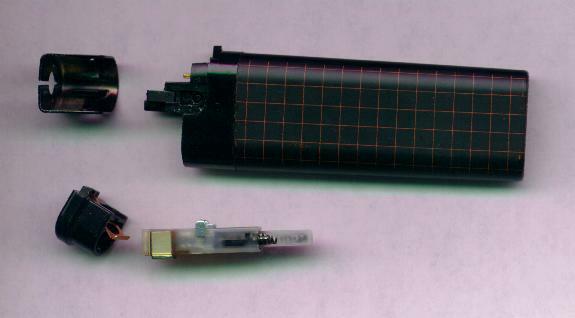 Below is a small lighter disassembled to show the igniter. The lighters come apart easily without tools. 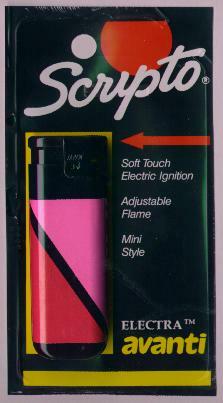 Below is the igniter from a large fireplace lighter (I have found some non-brand-name lighters at a hardware store for $1.99, but the brand name versions like the large Scripto are twice as expensive). The larger igniters take more abuse than the little ones, and they are much easier to connect the wires to, since they have nice little copper tabs that solder easily (they are designed so soldering isn't necessary, but I solder them anyway for a more permanent solid connection). While perfume (which is mostly alchohol) works pretty well, the best fuels are hair spray and Binaca. Hair spray has alchohol in it also, but it also contains large amounts of propane, butane, and isobutane as propellants (gases under so much pressure that they are liquids in the can, and turn to gas at the nozzle). These gases are excellent fuels. 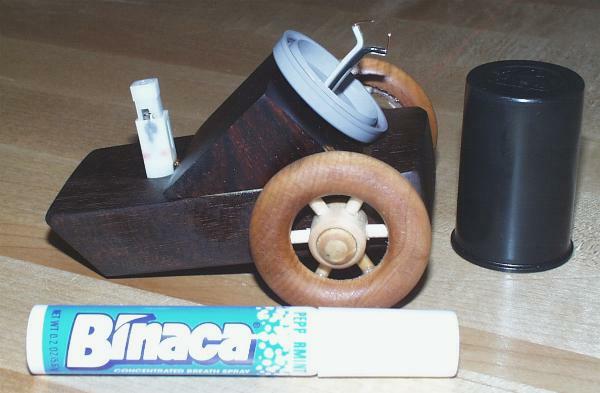 The Binaca is alchohol and isobutane, and comes in a very convenient dispenser. It fits easily in a pocket, and delivers just the right amount of fuel in a single push of its button. (The hair spray keeps spraying, so it is harder to get just the right amount). In order to make an explosion, you need a flamable gas, oxygen, and a source of heat to start things off. 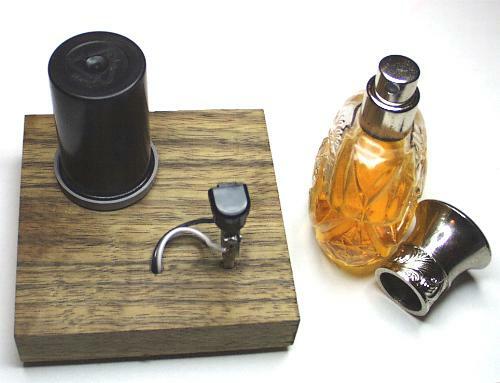 Solids like candle wax and liquids like alchohol only burn when they are heated enough to become gases. Then they need a little more heat to get them to break their chemical bonds so they can combine with the oxygen. By starting off with a gas like propane, or a vapor like that from alchohol that has been sprayed in a fine mist, we only need a small spark to start things burning. The Film Can Cannon can only hold a small amount of air and fuel mixture, so it is safe to fire off in the house. The plastic can is soft and light, and can land on people without disturbing their hairdo. But it takes off rather quickly, and it is not recommended to have your head in the way during a launch. The amount of air required to be mixed with the fuel will vary with which fuel is used. The ratio of air to fuel (called surprisingly enough, the 'fuel-air ratio') must be just right for some fuels. Other fuels (such as hydrogen) have a wide range of ratios which will explode. Hydrogen will burn in air at concentrations ranging from 4% to 75% by volume. Methane (natural gas) burns at 5.3% to 15%. Propane burns at 2.1% to 9.5%. Isobutane burns at 1.8% to 8.4%. Hydrogen will explode in air at ratios of 13% to 59%. Methane explodes at a much narrower range between 6.3% and 14% (ratios are fuel to air). It is easy to see how too little fuel will result in no explosion. But the ratios we saw in the preceding paragraphs show that the problem is more likely to be too much fuel. If your can won't go Bang!, try lifting it off the pad and putting it back. This will allow a little more air in, and you will probably get a bang out of the results. As the fuel-air mixture burns, energy is released by the formation of chemical bonds between the oxygen in the air and the carbon and hydrogen in the fuel. This energy heats up the gasses that result from the burning. The gases are water vapor (H2O) and carbon dioxide (CO2). Since they are hot, they expand. The expansion pushes on all sides of the can and its lid. The can and the lid separate quickly, and the can goes skyward. A more detailed explanation of exactly how the expanding gases cause the can to move can be found in the section on rockets, and the section on steam engines. How does the igniter work? 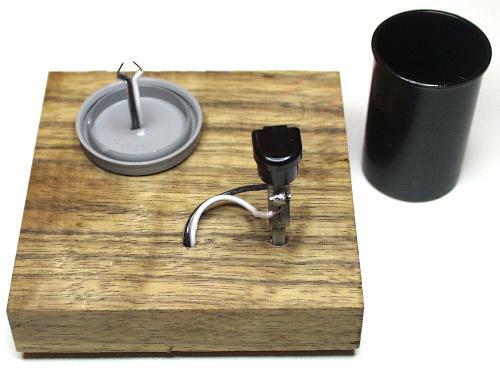 The igniter is a piezoelectric generator. The word piezo comes from the Greek word for press. A piezoelectric substance is something that makes electricity when you press on it. When pressure is applied to the crystal, the negatively charged oxygen atoms move relative to the positively charged silicon atoms. This causes electrons in the metal contacts to move, generating electricity. The piezoelectric material in the igniter is not quartz, but is instead a man-made ceramic that has been formed under a high voltage electric field to align the electric charges in it. These man-made ceramic piezoelectric materials can generate very high voltages. 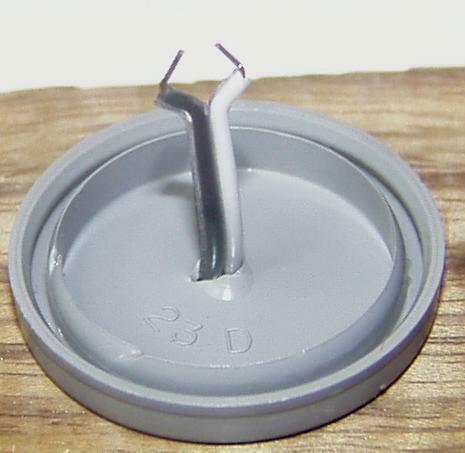 The igniter holds this ceramic element in a plastic case, with a steel hammer attached to a spring and a catch. As you push down the plunger, the spring is compressed until it hits the catch, which releases the spring, pushing the hammer quickly down on the ceramic. The electricity runs through the wires to the spark gap, which it jumps across, igniting the fuel-air mixture. I was at an upscale lumber yard when I found these little wooden spoked wheels. I just had to build a film can cannon with these wheels. 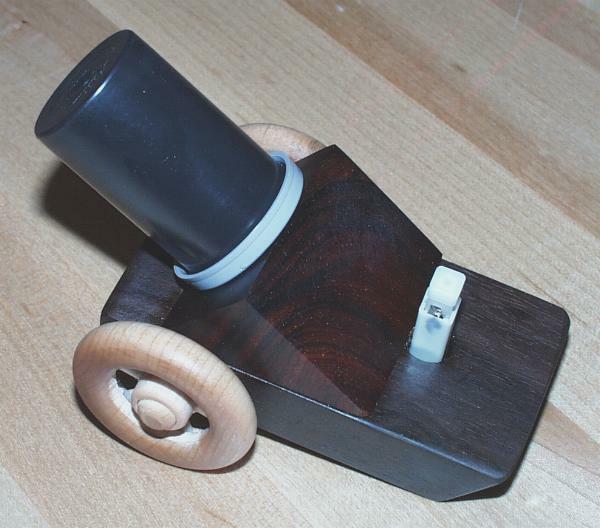 A little walnut, a little rosewood, a little clever drilling to hide the wiring, and we have the Mark II Film Can Cannon. This cannon is angled at 45 degrees to maximize the distance traveled horizontally (although due to wind resistance that angle is not exactly optimal). Of course, this cannon fires its entire barrel, but I can live with that. These are so popular I've had to make several to keep up with the demand. The photo above is either the fourth or the fifth, I've lost track. 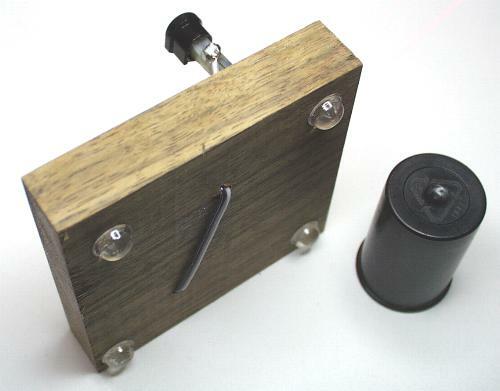 The Film Can Cannons have become so popular that we have set up an online store where we offer kits (and fully assembled cannons) for sale. 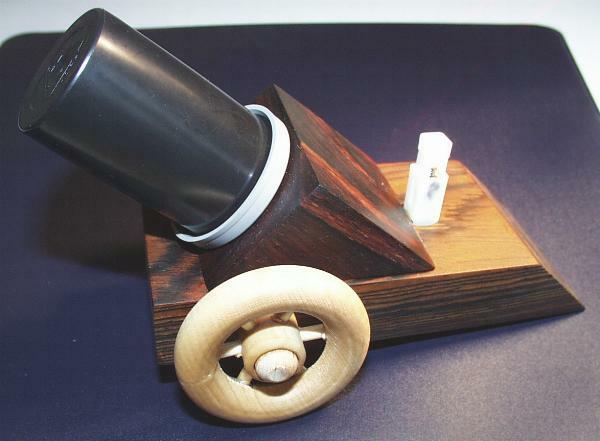 You can buy igniters in 10 packs (cheaper and easier than taking apart lighters if you're making several cannons) and we even have deluxe model cannons made of exotic hardwoods. See all of these in our catalog. For more information on thermodynamics, see the Recommended Reading section. Order cannon kits and parts here.